The city’s got you down – and time (or money) is short? No problem. Your vacation is a short drive from home. Here, a few of Calgary’s best out-of-town weekend getaways for the summer. See: Hike the Badlands or take a fossil safari ($12) in the world’s richest dinosaur bone beds. Stay: Camp amid sculptural cliffs and hoodoos ($23 to $29). The terrain may be primitive, but the park’s amenities – food concession, hot showers and electricity – are reassuringly civilized. See: Beat urban ennui with the stunning beauty of pristine lakes, bison-grazed prairie and Rocky Mountain crags. Drink it all in on an international boat cruise ($36) to Goat Haunt Montana. 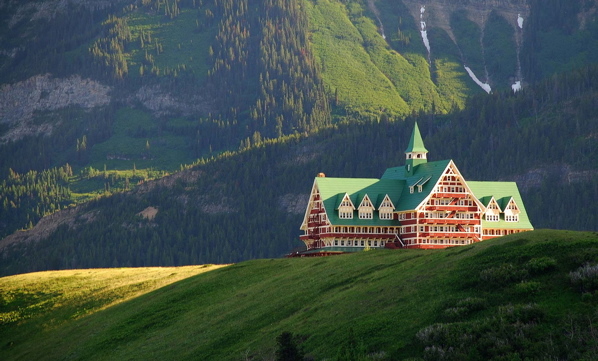 Stay: Indulge at the elegant, palatial Prince of Wales Hotel (pictured above, $199 and up) overlooking Waterton Lake. See: Indulge your inner cowboy with roping, riding and, uh, white water rafting in Bow Valley and Kananaskis Country. Stay: Kick back in the rustic luxury of the Rafter Six Lodge ($179 plus tax) or roast marshmallows outside your own log cabin ($215 plus tax, and up). See: Attend a Sarah Harmer show, a Banff Festival Orchestra performance or an art-film premiere. Stay: The centre’s stellar food and accommodations create a powerful muse. Indulge in upscale Rocky Mountain cuisine at the Three Ravens Restaurant and Wine Bar, then retire to a stone-and-timber lodge-style room ($189). Image courtesy of Gord McKenna.